Optimized for DVRs and NVRs, SkyHawk surveillance drives are tuned for 24x7 workloads in capacities up to 10TB. 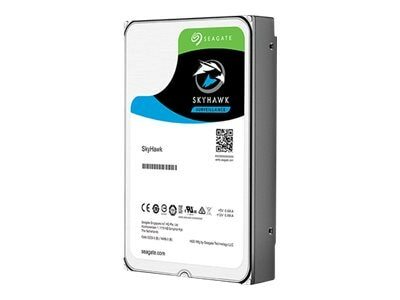 Equipped with enhanced ImagePerfect firmware, SkyHawk helps to minimize dropped frames and downtime with a workload rating 3x that of a desktop drive and IS ready to record up to 90% of the time while supporting up to 64 HD cameras. to record ~90% of the time and play back video footage the remaining 10%, and supports more cameras recording at higher resolutions than traditional drives. Up to 10TB or over 2000 hours of HD video storage supports an increased number of cameras and helps to ensure longer data retention periods are met.